A few weeks ago, I ate at Koa Pancake House in Hawaii Kai. The restaurant was clean and bright orange, the prices were reasonable, and everyone was smiling. Mmm, chocolate chip pancakes. Sometimes, the only thing better than breakfast for lunch is… breakfast for dinner. But as we were leaving, I noticed their hours: 6:30 am to 2 pm! No chocolate chip pancakes, no strawberry crepes with whipped cream, no chili and cheese omelets for dinner. And that got me thinking: what does the restaurant do after 2 pm? Nothing. After the last employees clean up and prep for the next day, the restaurant is closed. But what if it didn’t have to be that way? I once saw a TV commercial in which a clothing store by day transforms into a trendy restaurant by night, its paneled walls swiveling to reveal new products and furniture. I wish I could remember the commercial better – if you remember it, please let me know! It sparked an idea. What if two businesses could share the same location, the same space, but make their businesses totally different from each other? We could start a new trend of “Day and Night” restaurants and stores – one store by day, and a totally different store by night! * Shared restaurant spaces. This would be a great way for retirees to run their own business in the morning, leaving their afternoons free. We all know that if you don’t get there early enough, some okazu-ya and manapua restaurants close when the food runs out. Meanwhile, younger chefs could open just for dinner, trying out new menu ideas and starting their own business on a smaller scale. The two restaurants could share basic cooking appliances, utensils, and supplies. * Shared office spaces. Two companies may be able to share the same office space – if one of the companies runs a customer service call center, an after-hours medical or security monitoring service, or a student mentoring program by night. Cubicles and offices could be designed with two sets of lockable cabinets, but could use the same password-protected computers and desk supplies. One traffic solution is not to build more roads and parking lots, but to use the buildings we already have. * Shared retail spaces. It’s harder for retail companies to share the same space, but in one TV commercial they had rotating wall racks and sliding wall panels with entirely different products. Maybe two related businesses could partner to offer “night and day” products, like selling swimsuits and exercise clothes in the morning and evening dresses at night. It’s not a totally crazy idea. After all, telecommuters sometimes share cubicles, and there are even business service companies that rent office space and meeting rooms. I am fascinated by the idea that you could have a part-time business, a part-time store – and a fraction of the risk. With a little trust and cooperation, can two companies share the same space? What do you think? We drive our cars to the gas station to fill up our tanks. We sign up for home or office delivery of bottled water in huge jugs from companies like Menehune Water. Grocery stores like Foodland and specialty stores like Carousel Candyland in Kahala Mall let you bag your own snacks – charging you based on weight. But almost everything else we buy is in a single-use container, from laundry detergent and shampoo to cereal, rice, and bottled water. Most of us throw away those plastic containers. In my opinion, the biggest danger isn’t paper or plastic bags – it’s all of the plastic containers, jugs, bags, and bottles that we buy, just to throw them away when we get home. If we can’t recycle them, we need to be able to re-use them – or even eliminate them entirely. In London, the supermarket Unpacked asks you to bring your own containers from home. You weigh your containers at the counter and then choose the product and amount you want to refill –oils and vinegars, beverages, herbs and spices, household cleaners and laundry detergents, even cheese and yogurt. In France, the Cora supermarket in Dunkirkand eight other supermarkets have wine vending machines. Only in France? Maybe not. In Miami,Florida, the Green Forest Initiative can deliver chemicals via liquid pumping delivery trucks to hospitals, hotels, and restaurants to minimize plastic container use. There are even Green Forest Refill Stations that lets you refill laundry detergent products in your own containers. Despite the added hassle of cleaning your containers and then taking them with you to the store, and concerns about food safety, I think it would be a great idea if a Hawaii company started a pilot program with refill vending machines or staffed refill centers. The initial program could offer laundry detergent, shampoo, conditioner, and household cleaners. If people are interested, a second phase could add selected grocery items like cooking oil, flour, baking soda, cereal, potato chips, and juice – even pet food and litter. A third phase would consider perishable items like milk, beer, wine, and soda. 1. Clean your containers thoroughly. Inspect them for cracks and make sure the cover is tight. 2. Bring your containers from home (plastic, glass, Tupperware, even Ziplock bags). * Remember to bring a bag or box from home, or line your car trunk in case there is a leak. 3. Choose the product and the amount that you would like to buy. The refill station measures the amount of product you selected, by weight or volume. If we could get a bring-your-own-container service started in Hawaii, we could minimize all the extra plastic bottles, cardboard boxes, and plastic bags that clutter our landfills. We could save money, if companies pass on their cost savings to us. We could reduce the number of wood pallets and shipping boxes needed to move all the individual boxes that we buy. We would have more control over the amount and cost of the food and products we buy. Would you use a refill station if it could save you money and help our environment? As a teenager, I enjoyed the glamour of the Miss America beauty contests. As an adult, I avoided the seemingly shallow beauty pageants for their emphasis on outward beauty, swim suits, evening wear, and a single “on-stage” question. But listening to profiles of the 2011 MissHawaiicontestants on KHON2, it occurred to me that all of these young women had to examine their lives and focus on one “platform” that reflects their priorities and values. They had to think about what is really important to them, and explain how they can make a difference. That’s something I never had to think about it high school or college. I was never asked to focus my energy on a specific issue or cause. And aside from community service, no one challenged me to have a passion. The emphasis was always on college or finding a job. Maybe we all need to participate in a beauty pageant in order to find our calling in life. Well, not a beauty pageant exactly, but an “inner beauty pageant.” There is more to life than work, and sometimes a calling can become a career. Here are three ideas that schools could use to help students find their “platform” and motivate them to share it. * Summer internship with non-profits. Public schools could partner with non-profit organizations to create summer internships. This would give students real-world experience with a social cause, letting them work directly with the community and government for school credit. Non-profits and the community would benefit from students’ help and enthusiasm. * Student-run public service campaigns. Public schools could add an elective class that lets students choose the social causes that they want to champion. Students, either individually or in teams, would need to explain why the issue is important to them, come up with ways they can participate in and support their cause, create an education program, and encourage others to get involved. * “Find Your Calling” Senior Thesis. As part of a college/career guidance class, public schools could create an elective Senior Thesis program which would help students choose a social cause that resonates with them, and help them find ways that they could participate in or educate others about the cause. I wish that as a young adult I had been challenged to find my passion and how I could make a difference. Have you found your passion? How have you answered the call? “The best diet is the one you don’t know you’re on” (page 11), declares marketing and nutritional science professor Brian Wansink in “Mindless Eating: Why We Eat More Than We Think” (2006). In the book, there are no recipes, menus, or point-systems. It’s all about reengineering your environment to lose weight without feeling hungry, and it’s full of insights that can change the way you think about what you eat. 1. Big plate, small plate: We eat more when we have big plates (and plate lunches). Try using a smaller plate (or mini-plate lunch) instead. Here’s another tip: use smaller serving spoons! 2. All glasses are not equal: We drink more when we use short, wide glasses. That’s great if you’re drinking water. But if you can’t resist a high-calorie or alcoholic beverage, try drinking from a tall, skinny glass instead. 3. You see what you eat: The more we see, the more we eat – like snacks in clear packaging, candy in glass dishes, or snacks in clear jars. Put vegetables and fruits front and center, so you can grab an apple instead of a bag of chips. Put snack foods out of sight and out of reach (in a cabinet or on the refrigerator), so that it takes more effort to eat it. 4. Portion-size it: We eat more when we eat straight from the bag. Put snack foods in portion-controlled plastic bags to create your own 100-calorie packs. 5. Work for it: The easier it is to eat, the more we will eat; and the more hassle it is, the less we eat. So put tempting foods farther away, and make sure that there are only vegetables and fruits at the dinner table (you’ll have to get up for a second serving). 6. Distraction-free snacking zones: We eat more when we’re distracted by television, radio, books, computers, and our phones – even when we’re not hungry. When snacking, don’t get distracted by anything else, and don’t eat straight out of the bag! 7. Turn everyday dining into fine dining: We often taste what we expect to taste. To encourage people to eat healthier (especially kids), use expressive names to describe your food. It’s not just chicken, but pan-seared home-style chicken. Tell kids that it’s not just broccoli, but dinosaur trees for growing dinosaurs. Set the scene with softer lighting and relaxing music to encourage eating. The goal is to find the “mindless margin” in which we “can either slightly overeat or slightly undereat without being aware of it” (page 30) – and lose 100-200 calories each day without feeling hungry. That means losing up to 10 pounds each year – or at least, not gaining any weight! I highly recommend “Mindless Eating” and making small changes to create better, mindful eating habits. For more information about “Mindless Eating,” visit www.mindlesseating.org. What an amazing, liberating idea! But first, you need to know what you expect out of life. And that’s where “The Art of Non-Conformity: Set Your Own Rules, Live the Life You Want, and Change the World” (2010) by Chris Guillebeau can help you “challenge authority and live unconventional, remarkable lives” (page 6). To get started with your remarkable life, you must be open to new ideas, dissatisfied with the status quo, willing to take personal responsibility, and willing to work hard. As Guillebeau reminds us, “No one else can be responsible for your success or well-being but you” (page 88). * The Power of Convergence is about eliminating the unnecessary, welcoming a life of abundance, and starting your legacy now to make a lasting impact on the world. Don’t be discouraged by people who criticize you for being “unreasonable,” “unrealistic,” or “impractical.” Remember that “Innovation comes from entrepreneurs and others who are willing to accept risk and try new things. Improvements in social justice come from those who question authority,” (page 222). 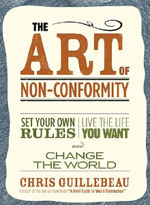 “The Art of Non-Conformity” is enthusiastic, creative, and encouraging, written with an honest, straightforward style. The chapters are succinct, with personal stories, anecdotes, and quotes. I completely agree with Guillebeau’s emphasis on life experiences, though I couldn’t quite relate to his extreme fervor for travel. The book challenged me to take a look at my life. I felt energized. I took some small, first steps: I wrote a “life list,” thinking about the things I want to do and accomplish. I started eliminating the unnecessary (I set aside bags of clothes and household items to donate). I started investing more in others (I answered two micro-loan requests on Kiva.org, which isn’t about charity – it’s about helping people help themselves). For more information and resources, visit www.chrisguillebeau.com or facebook.com/artofnonconformity. You are currently browsing the Better Hawaii weblog archives for June 2011.